Easter week is upon us and this week is called Holy Week…a week set apart to think, ponder, and worship Jesus for his death and resurrection. There’s still time my friends. We have a whole week where we can spend a little bit of time each day thinking of Him and building up anticipation to the big day, Easter Sunday, when we remember Jesus conquering death and giving us a NEW life! So, let’s celebrate Holy Week. Sunday– Share with your kids that Jesus is the Servant King. Tell them the story of Palm Sunday. Let the kids climb on Daddy’s back and ride around the house. Wave a branch from a tree outside and lay down coats as they pretend to be King. Monday– Cuddle up on the couch and read Easter books! 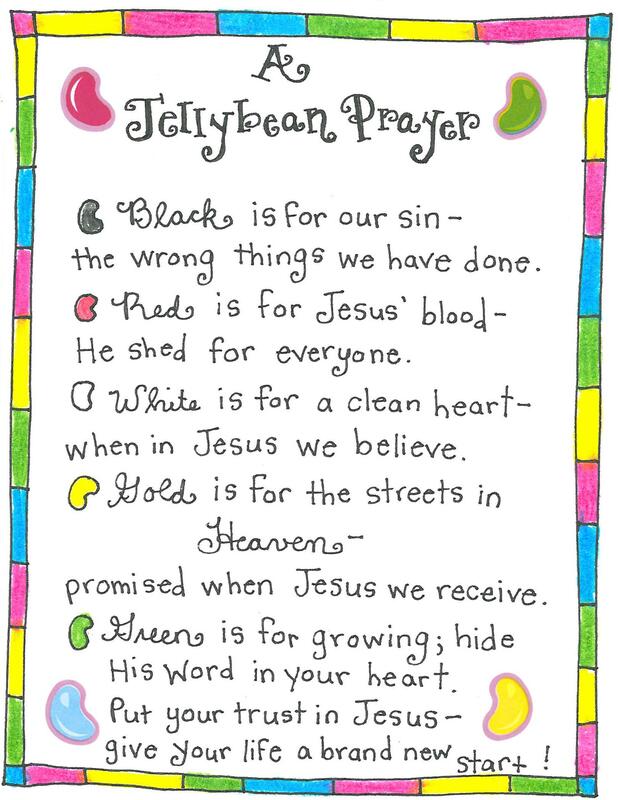 Tuesday– Share the Jelly Bean Prayer with your kids. Put some extra jelly beans in a ziplock bag and encourage them to share the jelly bean prayer with a friend that week. Wednesday– Spring clean the house! In some cultures, it is tradition to clean the house in preparation for Easter. I love this idea, and what a lovely illustration it gives to the children. Have the kids help you and while you are cleaning remind them that Jesus washes their sins away! Put some fresh flowers in the house or maybe a new decorative item that spruces the place up and makes it an extra special place to be for the week. Thursday– Have a picnic and share the Last Supper! Have some juice and bread and tell your kids what they represent–Jesus’ blood that would be poured out on the cross and His body which would be broken for them. Saturday– Make resurrection rolls for breakfast! Take a crescent roll, a big marshmallow, melted butter, and cinnamon and sugar to teach them the Easter story. Prepare Jesus (marshamallow) for burial by rolling in the butter and cinnamon and sugar. Wrap him in cloths (crescent roll), and lay him in the tomb (the oven). When they are done, pretend an angel comes and rolls the stone away. Take rolls out of oven, and you will see that Jesus (marshamallow) is not there! Enjoy a church service together or have your own. Take the figure out of the tomb from your resurrection garden on Friday, and let them find the empty tomb! A dear friend of mine and mom to four grown children, once encouraged me with this. She told me her kids don’t really remember the specifics of what all she did for them (like crafts, recipes, activities, or stories) BUT they do remember she spent time with them, she was present and engaged with them, and was making wonderful memories along the way. So I leave you with this–No matter what we “do” with our kids for Easter, let us love them this week and by God’s grace point them to Him. Missed this one. Love the day by day help. Thank you for mapping out the week. You are really gifted at this, gal. Thanks Leslie! I so appreciate your encouragement to me to focus on what’s important with our kids (time, snuggles, intentional interaction) and not to get caught up so much in the presentation. Hard to do in our world today! A little tradition I did with the kids that they loved, simple and easy. Get the packaged frozen bread dough sticks. Let them thaw and twist them and braid the 3 of them into a “crown” which they can bake. Then they can put toothpicks all over to make it a thorny crown. Of course we discussed that crown of thorns and His death and what it means to us as they did it. Cathy–I love this idea! It is so hard to see that crown of thorns and think of Jesus’ suffering–but so necessary to understand what an amazing thing He did–dying for us. Love hearing from you! Thank you for keeping our eyes on Jesus and our hearts on the gift of the cross and resurrection. I’m not sure what we will do this week but I will be praying for you to enjoy Holy Week with your family and we seek to bring thought and remembrance to Christ in our home as well!! Thank you for posting!! ? Thank you sweet Keri! I learn from the best! Praying we both experience greatly the power of the resurrection as we walk with Him.